Suwanee, Ga. (September 3, 2013) – Rugged Ridge® today announced the availability of its new Sherpa Roof Rack System for 2- and 4-door models of 2007-2014 Jeep JK Wrangler. Taking its namesake from the people of the Himalayas, the Rugged Ridge Sherpa Roof Rack is designed to add valuable cargo space above the roofline of JK Wranglers. A true bolt-on installation, the Roof Rack requires no modification to the Jeep’s body. The Sherpa Roof Rack features a unique tilt function, enabling Jeep owners to conveniently access their hard or soft tops with ease. With the Roof Rack system installed, hard top and freedom panels can be removed or installed, and the soft top can be retracted or raised. A built-in front catch cable and heavy-duty rear hinge ensures that the Roof Rack smoothly pivots back into place. Jeep drivers can customize the Sherpa Roof Rack with an optional Light Bar Lowering Kit and Adapter Kit. 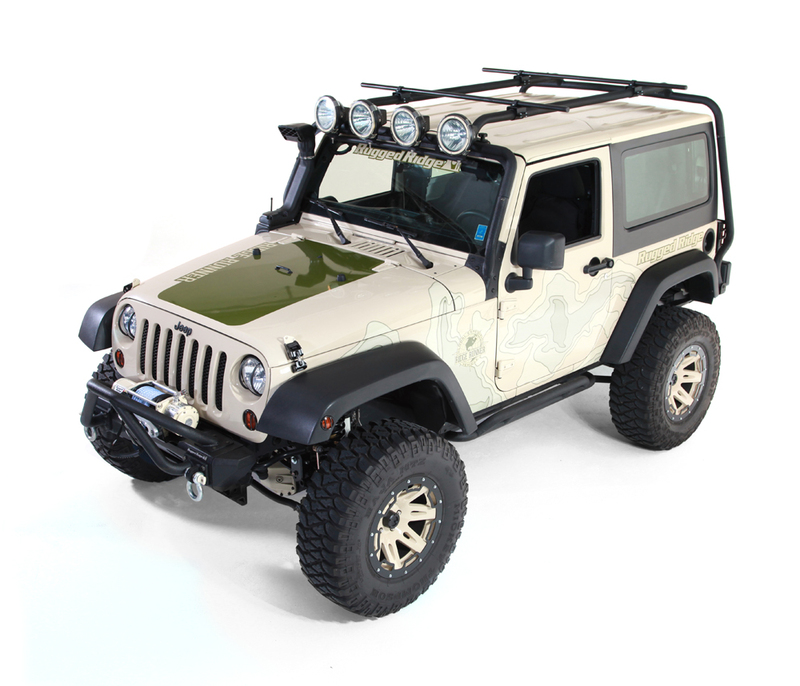 The Light Bar Lowering Kit acts as an integrated light bar, with space for up to four lights. The Adapter kit features clamps to allow mounting of industry standard cross bars and racks to hold luggage, bikes, kayaks, skis, snowboards and anything else required for outdoor excursions. Built as rugged as the Wrangler, all components of the Sherpa Roof Rack system feature the dual stage protection of a rust resistant E-coating and textured black powder coating. The Roof Rack system is also backed by Rugged Ridge’s 5-year limited warranty. The Rugged Ridge Sherpa Roof Rack is available online and through select Jeep and off-road parts/accessories retailers nationwide starting at $634.99 MSRP. For more information about the Sherpa Roof Rack system, Rugged Ridge’s complete line of high-quality Jeep and off-road products, or to find an approved retailer, please contact Rugged Ridge at (770) 614-6101 or visit its website at www.RuggedRidge.com.